A survey of 2,000 Brits found that 50% have never had the pleasure of enjoying breakfast in bed, sparking the Swedish retailer to inspire a change in how we start our days. 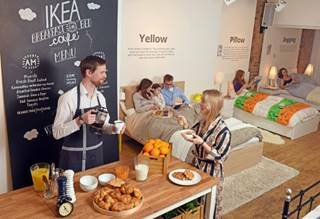 Patrons will get to have breakfast and choose from a menu of IKEA’s most comfortable beds and pillows – bringing a whole new meaning to ‘comfort food’. 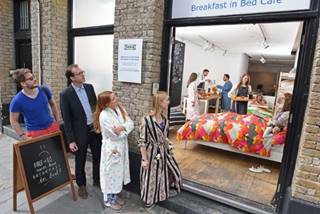 Open between 7am and 3pm until the 20 May, the Shoreditch based concept café has been created as a celebration of the sheer joy of having breakfast in bed – serving toast, tea, fresh juice and an array of traditional Swedish treats. Completely free of charge – patrons can book a bed between 7am and 12pm as they choose to relax in a single or double bed where they will be served by specially trained waiting staff and sleep specialists. At IKEA we believe that the delight of having breakfast in bed shouldn’t just be reserved for those special occasions and should be something that makes everyday wonderful. 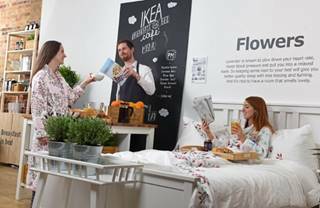 To celebrate this firmly held belief in starting the day the right way, we are opening The IKEA Breakfast in Bed Café to showcase how we can make our beds and bedrooms an oasis of serenity from the outside world”. To find out more about IKEA and why there’s ‘No Bed Like Home’, please visit www.ikea.com/gb/en/campaigns/atoz.html.